With the certainty of the passage of the income tax reform legislation that was signed into law on December 22 by President Trump, several of the recent RTE posts have focused on the principles of Supply-Side economics so that we can see how many Supply-Side principles the Tax Cuts & Jobs Act of 2017 follow. There are a large & sufficient number of pro-growth principles in the new tax legislation including the reduction in the corporate income tax rate that will bring American companies in line with competitors in the rest of the world (see graphic below), the inclusion of the "full expensing" provision that allows companies to immediately deduct the cost of innovative productivity enhancing capital investments from their tax bills instead of writing the costs off over several years, & the switch to a territorial tax system from a world-wide tax system - a part of which includes a form of repatriation of $2.65 trillion of unremitted foreign earnings by 311 S&P 500 companies led by Apple saying it would pay $38 billion in income taxes on the $250 billion in cash held overseas, & would invest, counting the tax payment, $350 billion in the U.S. over the next five years in capital spending plus purchases of parts & services from U.S. suppliers thereby creating more than 20,000 new Apple jobs (about a 25% increase in Apple's U.S. workforce) as well as issuing $2,500 bonuses in restricted stock to employees as a result of the passage of the new tax reform legislation. Microsoft, Pfizer, IBM, Cisco, Alphabet, J&J, Merck, GE, & Exxon-Mobil are other companies following Apple's example in this regard. But one particular feature of the December 22 tax law could augment the prosperity of the citizenry in new ways; namely, the benefit, especially to residents of the high tax states (CA, NY, NJ, CT, & IL), from the provision in the legislation that limits the aggregate deduction of state & local taxes (SALT) – i.e., income, sales, & property taxes - on all federal income tax returns to a $10,000 cap. "The SALT deduction operated as an effective federal subsidy for blue-state taxpayers because it returned to them some of the high taxes they paid to their state governments." 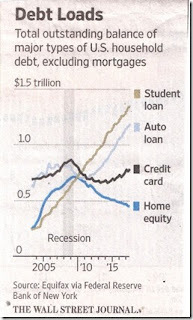 - Bill McGurn, writing in the WSJ. Mr. McGurn reports that much of both the high spending & taxes in the above listed high-tax states is driven by public sector unions – an indispensible & dominant constituency of the Democrat Party. The new tax law gives us a chance to eliminate this waste. We all know, or @ least have heard, that people earning millions of dollars of combined taxable income have left the high-tax states listed above, over the years, relocating to states with low or no state income tax (Alaska, Florida, Nevada, South Dakota, Texas, Washington & Wyoming). For instance, economics professor Arthur Laffer relocated from California (top marginal state income tax rate = 13.3%) to Tennessee (no income tax on salaries & wages but does have a tax on interest & dividends over $1,250 for single taxpayers that is scheduled to be repealed on January 1, 2021). New Hampshire has a state income tax system like the current one in Tennessee. The limitation of the SALT deduction on federal income tax returns will accelerate the out-migration of high earners from high-tax states because these high earners will finally feel (almost) the full effect of the federal tax levy. The new tax legislation removed the advantage residents in high-tax states had previously used to lessen their federal tax burden through the SALT deduction. In short, high state & local taxes were offset, in part, for decades by the SALT deduction on federal income tax returns. Now there have been studies conducted over the years that show people do not move from high-tax states because of state income taxes. 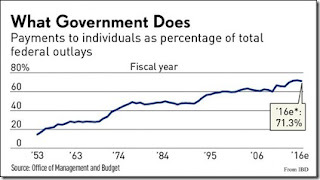 If you are talking about a thousand dollars or two per year people absorb the additional cost for reasons other than economic – like staying close to family or friends or staying in an otherwise good job because the employer compensates for the high state & local taxes that they know all employees must pay. But with the limitation of the SALT deduction in the new tax law you are talking real money in high-tax states & politicians like NY Governor Andrew Cuomo & Steve Sweeney, President of the NJ Senate, are worried. Cuomo said he may 1) sue the federal government, or 2) try allowing state & local taxes be counted as charitable donations that are deductible, or 3) enact a new payroll tax on NY residents & issue a "wage credit" to make residents whole after they pay this new tax. Sweeney is more level headed & told the new socialist NJ governor, Phil Murphy, that we don't want to see all the wealthy people leave NJ. Readers who participated in the SALT Deduction Quiz two posts back clearly learned the relationship between lower marginal tax rates & eliminated deductions – especially the SALT deduction. I know I learned a lot just writing the quiz. And a lot more working out the solution. 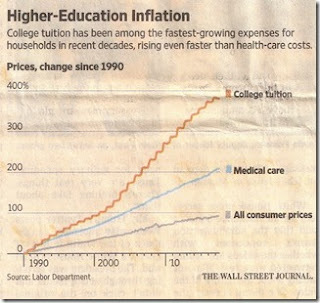 amounts over $600,000 per year. So let's see what happens to the federal income tax increases in 2018 for residents, married filing jointly, in the above high SALT rate states when their incomes rise to the level of the NYC threshold ($2,155,350) to pay the top 12.7% NYC SALT rate. NYC: $52,300 federal income tax increase in 2018, California: $57,500 increase, Oregon: $28,400 increase, Minnesota: $28,000 increase, New Jersey: $20,500 increase, Vermont: $20,300 increase, Hawaii: $14,300 increase, & Connecticut: $3,600 increase. 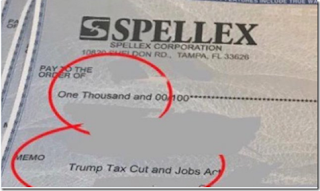 The people who will pay the above federal income tax increases will have a decision to make regarding where they want to live - there have been reports of one way U-Haul rentals from California to Texas or Florida for years. Conversely, the governors & state legislatures will have to decide whether or not to continue the high costs of state governments now that the SALT deduction has been limited. Looking @ the above numbers it is not hard to believe that there are people in California, New York, & New Jersey who could pay significantly more than indicated above in federal income tax increases each year because of the reduction in the SALT deduction. But of course the state & local income taxes described above are just part of the SALT deduction that has been capped @ $10,000. Consider the tax map below to see the states where property taxes alone can reach the $10,000 cap thereby making the above state income tax increases real minimums. The effective tax rates shown on the above map are the average annual property taxes expressed as a percentage of the average estimated market value of homes. According to ATTOM Data Solutions, based on analysis in 2016 of more than 84 million single-family homes, the average annual property tax in the U.S. was $3,296 & the effective tax rate was 1.15%. Therefore, I estimate that couples in up to the 24% income tax bracket (combined annual incomes of $165,001 to $315,000) have a good chance that the $10,000 SALT cap will not be exceeded if they itemize deductions on their federal income tax returns. Perceptive readers will have noticed that California is not on the above map of high property tax states. This is because in a bygone era, California Proposition 13, was passed in 1978 that defined how property taxes in California are calculated & reassessed - & it remains in effect today. The standard tax rate in the state was set in 1978 @ 1%, per the proposition. The property tax base amount is determined by multiplying 1% of the original sale price listed on the deed with no more than a 2% increase every year. Someone who is still living in a house bought in California 35 or 40 years ago is not paying an exorbitant amount of property tax by this formula but someone buying the same house tomorrow will have the base amount raised significantly to the purchase price & therefore the property tax will significantly rise too. In summary, the Tax Cuts & Jobs Act of 2017 includes Supply Side economic principles that will give both middle class & top income earners reductions in their federal income taxes but top earners in high SALT states will have a choice to make in order to realize the benefit – they will either have to relocate to a low SALT state like Arthur Laffer did, as described above, or work with their governors & state legislators to reduce the high spending & tax costs in their current states. Either alternative will put the money detailed above as tax increases for 2018 & beyond to better use for augmenting American prosperity in that the dead weight loss of states currently operating under socialist theories will be removed or lessened. "If Hillary (Clinton) had been elected, we would have had more regulation & higher taxes. 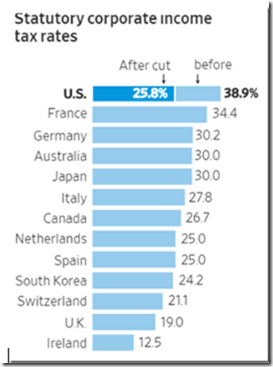 Trump was elected; we have less regulation & lower taxes." – Byron Wien, Wall Street executive - Blackstone Group L.P. This statement by Mr. Wien encourages each American to decide for themselves whether "it (is) improbable the wealth created by government spending will fully compensate for the wealth destroyed by the taxes imposed to pay for that spending." - Henry Hazlitt, Economics In One Lesson – page 37 from the Chapter entitled Taxes Discourage Production. Hazlitt's statement is the bedrock economic question separating statists from libertarians. Earlier this month the Department of Labor's Bureau of Labor Statistics (BLS) reported the unemployment statistics for December. 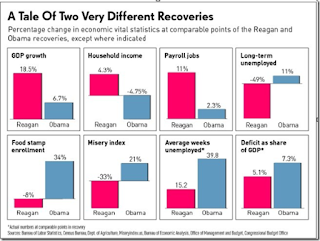 The official headline measure of unemployment, U-3, stayed @ 4.1% – the lowest level in seventeen years for the third straight month, black unemployment fell to 6.8% – the lowest level since 1972 when records were first kept for black unemployment, & Hispanic unemployment came in @ 4.9%, which was just above a record low. In addition, the initial jobless claims for the week ending January 13, a proxy for layoffs across the country, was the lowest for claims since February 1973. 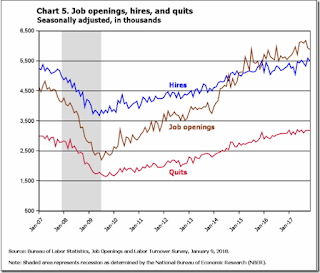 But unemployment statistics are just one part of the puzzle that adds up to faster economic growth – which has been meager since the recession ended in June 2009. Please note the government's headline unemployment statistics can be misleading – people counted as employed in determining U-3 could be working as little as an hour a week. 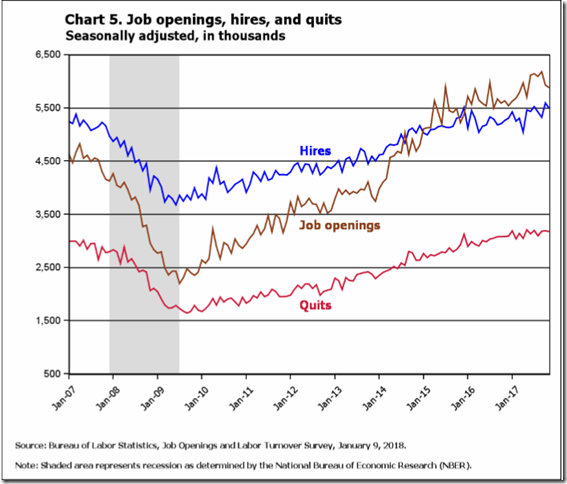 Employers are still having trouble finding qualified workers. See graphic below that shows 391,000 more job openings than hires in November, 2017 – the last month for which data are shown on the graphic, with the number of hires actually slowing in November 2017, prior to the passage of the new tax law in December. Payrolls grew only 1.4% in 2017. U-6, the unemployment measure that includes the total unemployed (U-3), plus all persons marginally attached to the labor force including discouraged workers who have stopped looking for work, plus the people working part time who want full time employment increased in December to 8.1% from 8.0% in November. 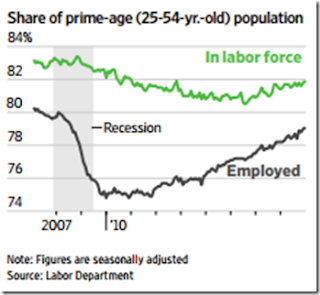 And the share of workers 25 to 54 years old is still below the prerecession level in December 2007 – 10 years ago – for both employment & labor force participation (see graphic from the WSJ below). Although U-6 is the broadest & most complete picture of unemployment & underemployment that the government tracks I have recommended a U-7 category that would include all of U-6 plus those employed full time who make a fraction of their former pay. U-6 & U-7 give the most complete picture of those relying on their wealth spend down to live on, whether that of friends or family, which is an excellent measure of the unhealthiness & misery of a job market. Click here to hear President Kennedy explain the supply side economic principles that are the key to achieving economic growth - the increase in a country's productive capacity that results in prosperity, wealth creation, financial independence, success, strength, & rising standards of living for the American citizenry. The Tax Cuts & Jobs Act of 2017 includes many of the principles President Kennedy embraced in the above video & is the shot in the arm that businesses have been waiting for. James Dimon, CEO of JPMorgan Chase, recently said the new tax law was "a big, significant positive, & much more of it will fall to our bottom line in 2018 & beyond." In fact, less than a month after President Trump signed the new tax bill into law "many people feel the economy is on fire" - Charles Payne FBN. This "on fire" feeling is a much better measure of where the country is headed than government statistics on unemployment as people anticipate Trump, the business man, working to return prosperity to the citizenry by removing them from government dependence & making America once again a land where free enterprise thrives. So far, over 100 companies have given hundreds of thousands of workers bonuses, pay hikes, & improved benefits – such as doubling the employer matching share of 401(k) accounts - as a direct result of the lowered tax rates in the Tax Cuts & Jobs Act of 2017. Americans For Tax Reform tallies at least 985,101 Americans (and counting) are receiving what ATR calls "Trump bonuses." Just let me know if you would like the complete list of the 100+ companies that have so far participated in tax relief & I will send it to you. 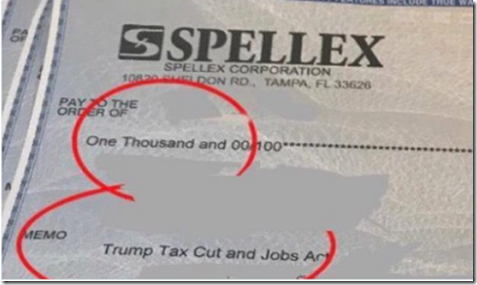 With regard to the "Trump bonuses" Spellex, a Florida-based software development firm founded in 1988, not only gave each of their employees $1,000 bonuses but filled out the memo section of the employee bonus check to say "Trump Tax Cut and Jobs Act." See image below. Mike Huckabee also reports that Trump has eliminated 22 existing regulations for every new regulation posted in 2017 – Trump's business-friendly regulation-reducing administration coupled with the new tax bill provides the catalyst for businesses to respond with the bonuses & other benefits indicated above that start to reverse the secular stagnation that BO wanted everyone to believe was the new normal of slow economic growth centered around government dependence. 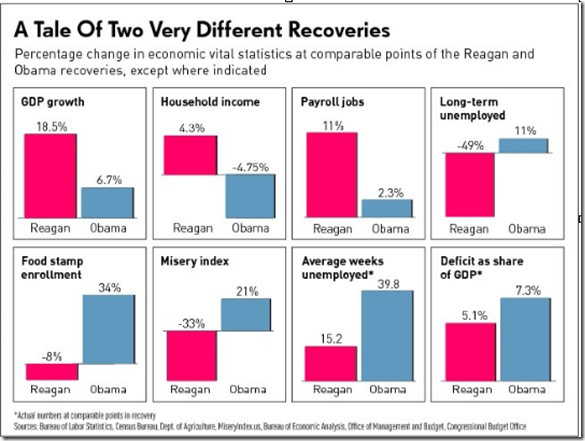 Socialist economies have never advanced anywhere in the world & the following graphic comparing Reagan's capitalistic free enterprise economy to that of BO's mixed – socialist – government dependent economy shows the dramatic difference in the recoveries that Americans are expecting to positively realize once again under Trump now that a pro growth tax plan has finally been passed into law. 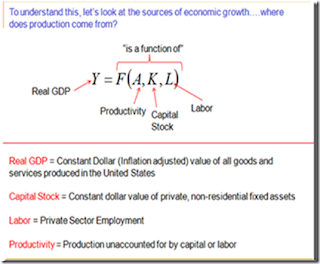 The following graphic indicates that economic growth is a function of labor & productivity powered by capital investment. Stanford economics professor John Taylor teaches that economic growth equals employment growth + productivity growth. Productivity growth is powered by increases in investment, innovation, & entrepreneurship. Long term, the economy grows because of capital & savings, including savings that children running lemonade stands, or washing pans in a bakery for allowance money, deposit in passbook saving accounts. A great way to get started in becoming an entrepreneur. The reduction in the rate of corporate income tax, the switch to a territorial tax system from a world-wide tax system, & the inclusion of the "full expensing" provision in the new tax bill that allows companies to immediately deduct the cost of capital investments from their tax bills instead of writing the costs off over several years, where inflation takes a mighty toll, can only add to the productivity enhancing investments that companies make. Under BO's administration labor productivity lagged as new investment barely managed to offset depreciation – source Phil Gramm & Michael Solon. 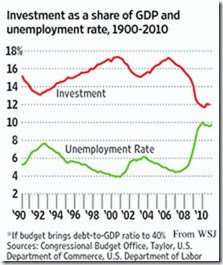 The following graphic traces the investment ups with the unemployment downs & vice versa from 1990 to 2010 in perfect harmony. Solving our real unemployment & underemployment problem of not producing enough good paying jobs does not have to get any more complicated than unleashing capitalists to invest in productivity increasing plants & machinery. Innovation is the production of knowledge & high paying jobs will result from innovative investments if the workforce is properly trained so they can take advantage of the improved job opportunities. Look for, & make note of, those petty political enemies of Trump who for no good reason, are against everything Trump does or proposes, who deny & fight against any benefit the new tax law brings, thereby showing they are not for the American citizenry, & not for the economy to grow with people realizing enhanced prosperity & financial independence. Such anti-Trump people include detestable politicians, the hostile anti-American media, prowling, stealing, & cheating opportunists, blindly partisan, uncompromising, opinionated, assertive, authoritarian, unyielding, & inflexible propagandists who really are not looking out for you & they could not be showing it more clearly than they do with every tiresome attack on President Trump – no matter what he says or does. In short, things are in place, & have already started, to get better. The people I describe above – they're rooting against America. 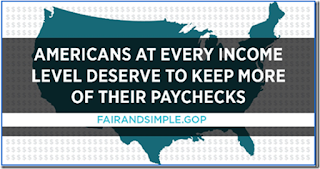 "If enacted, the current version of the bill would raise taxes for many of my constituents. It would do that in part by eliminating the deductibility of property taxes, income taxes and paid sales taxes." – California Republican Congressman Dana Rohrabacher expressing his opposition to the proposed tax reform package in an op-ed in the Orange County Register in November before the Tax Cuts & Jobs Act of 2017 was signed into law on December 22 that will do exactly what Rohrabacher wrote for many of his constituents. Rohrabacher was joined by fellow California Republican Congressman Darrell Issa, four NJ Republican Congressmen (Frelinghuysen, Lance, LoBiondo, & Smith), & five NY Republican Congressmen (King, Zeldin, Donovan, Faso, & Stefanic) who all voted against the tax bill because of the loss of the state & local tax (SALT) deduction. Republican Congressman Walter Jones of NC also voted against the bill because of his concern about the increase in the national debt that he thinks will follow. The foregoing Republicans, except Jones, are feeling the heat of running for reelection in 2018 in high SALT deduction states. In fact Issa has already announced he has dropped out. This post provides the information that lets us determine for ourselves whether or not the high SALT deduction states (NY, CA, NJ, CT, & Il) are the only ones affected by the Tax Cuts & Jobs Act of 2017. Well not quite Americans @ every income level will keep more of their paychecks, but the fact is that in 2018 there will be 143 million federal income tax payers who will receive an income tax cut & about 8.5 million who will pay higher income taxes with a few breaking even – source Steve Goldstein, D.C. Bureau Chief for Market Watch. This works out to over 94% of federal taxpayers paying less in 2018 & just over 6% paying more – largely because of the elimination of the SALT deduction starting in 2018. The combination of paying both federal & state income taxes is exacerbated with the elimination of the SALT deduction & is the topic of the subject quiz below. See graphic below from the Tax Policy Center for the breakdown, by income, of who gets tax cuts & who gets tax increases from the new tax bill. Since the subject quiz below is a form of multiple choice, responders should explain how they get their answer. Individuals in the highest federal income tax bracket will see their rate drop from 39.6% in 2017 to 37% in 2018. Middle class tax payers, five federal income tax brackets below the highest, in the 15% tax bracket in 2017, will see their federal rate drop to 12% in 2018. In 2017 the deduction of state income tax was allowed on federal income tax returns – for the purpose of this quiz assume that taxpayers in both the highest & middle class federal tax brackets previously mentioned took the deduction of state income tax in 2017 & that their incomes are identical in both years. Considering only the elimination of the deduction of state income tax in 2018 – for people, married filing jointly, in both the top federal bracket & middle class federal bracket previously indicated, please determine in which of the seven states listed below that the residents will receive a federal income tax increase in nominal dollars in 2018. The percentages shown next to the seven listed states below are the state income tax rates that apply to both the highest income earners & the middle class earners in the respective states in both 2017 & 2018. Iowa – 8.98%, Idaho – 7.4%, South Carolina – 7.0%, Delaware – 6.6%, Illinois – 4.95%, Pennsylvania – 3.07%, Texas – no income tax. The above passage from Supreme Court Associate Justice Ruth Bader Ginsburg's concurring opinion in the 2012 ObamaCare case explains the thinking, theory, & philosophy of law of the liberals on the Supreme Court that started in 1937 & continues to this day; namely, to them America was founded in 1937. Having the Supreme Court, Congress, & many presidents over the past 81 years "set the Nation's course in the economic & social welfare realm," while ignoring their oath to the Constitution, has taken many large tolls on liberty & prosperity in America – especially the latest trend in which millennials favor socialism & government dependence over capitalism. 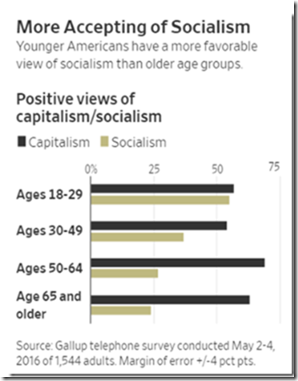 The graph below indicates that people aged 18 to 29 have almost as positive a view of socialism as they do of capitalism. The approval ratings of socialism in age categories other than millennials are also very troubling to me. Hillsdale College provided not only the latest confirmation, but an even upping of the severity of the problem from the above graphic, as it relates to millennials: "nearly half of all Millennials – our nation's next generation of leaders – said they would rather live in a socialist or communist country over a capitalist democracy such as the U.S.! This comes after we witnessed the shocking support that avowed Socialist Bernie Sanders received in the 2016 Democratic presidential primary. Sanders received nearly three-fourths of the vote among 18-29 years olds." In short, these millennial voters prefer an America founded on the socialist principles enacted by FDR in 1937 – not the libertarian principles of limited government, personal responsibility, & free enterprise that America was founded upon & originally followed. Millennials are the best (worst) example of point #1 (provide seemingly free education through government schools where the graduates are little more than illiterate & not proficient in math or science) of The Five Points Of Citizen Control in which today over 90% of people are educated by the worst monopoly going - failing government schools which make up the largest socialized enterprise in the U.S. To keep passing & graduating children who really do not know anything useful (& are too poorly educated to know that they don't know anything useful) will create a government dependent society even worse than the one we have become. A socialist school system is going to teach socialist values erasing or not mentioning capitalistic values along the way. The monopoly power is being exercised by teachers unions. They are running the schools to promote their own objectives, not the objectives of the students. Neal Boortz once said that "teachers unions are more dangerous to America than al Qaeda" & he is so right. Control of the education system as described above naturally leads to Citizen Control Point #2 which is to have a hostile anti-American media tell the poorly educated people from Citizen Control Point #1 what the news is. Control the media & you control the information that the poorly educated government schooled people hear & believe. These people are never able to discern or piece together why life does not get better for them. In short, they keep voting for the same shysters who are their worst enemies. Millennials are not proud of their heritage because they have never been taught it properly, if @ all. American history & civics are no longer taught @ any level from elementary school on up & it shows with every man on the street interview – many embarrassingly conducted on college campuses - you see where people in their twenties cannot identify George Washington or former VP Joe Biden or just about everyone else in between. During the year end Christmas & New Year's holidays many parents & students assessed whether they are paying more for a product (college education) & getting less & less from it every year – they are asking are they getting their money's worth? Considering just the cost & not the resultant product – the graphic below shows that college tuition has grown four times faster than consumer prices & almost twice as fast as medical care from 1990 to 2017. 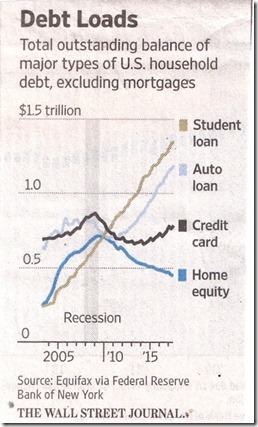 By another measure of trouble the graphic below shows that student loan debt went from the lowest, about $250 billion, of the major types of U.S. household debt in 2004 to the highest, $1.3 trillion, in 2017. All of the trends of millennials toward socialism & government dependence proves Hillsdale's point that far too many students "are not learning the most important things from a civic standpoint: the history of America & our nation's great heritage of liberty." 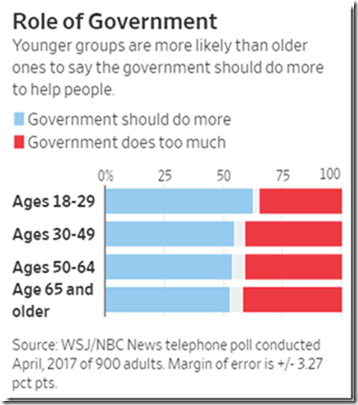 In the following graphic millennials are joined by a majority in every age group in thinking that government should do more. In essence the majority of the citizenry are throwing away the roots of our founding that led to all the prosperity in America. The government has brainwashed the majority of the citizenry to think they don't have to take care of themselves. In 2011 I posted the stats that some 50.5 million Americans were on Medicaid, with 46.5 million on Medicare, 52 million on Social Security, 5 million on SSI, 7.5 million on unemployment insurance, & 44.6 million on food stamps & other nutrition programs. Some 24 million get the earned-income tax credit, a cash supplement. In 2010 such payments to individuals were 66% of the federal budget, up from 28% in 1966 – see graph below that shows 71.3% of the total 2016 federal budget is dedicated to payments to individuals. This is a lot of momentum toward government dependence & it has only gotten worse since these statistics were compiled. So millennials, & really far too many other Americans, are looking to something other than themselves – to an authority, government, religion, or custom to provide, & actually be, the answer for all their problems – anything, whatever will fill the bill except themselves. These are the people, statists who believe in the sovereignty of government & all its bureaucratic inefficiencies, red tape, & false promises of utopia, who think & act as if the country was founded in 1937 – they are the enemies of American liberty & prosperity - & proponents of equality of outcome, victimhood, & misery. These enemies of America, the statists who imagine & prefer that the country was founded in 1937, do not recognize, or cannot be troubled to think, that the Laws of Nature & of Nature's God, that Jefferson wrote about in our founding document in 1776 - the real founding of America - had already given man, since before the beginning of time, the ability to make his own way in the world, as a heroic being who lives by his own effort, achievement, & reasoning ability, whose purpose is to glorify the Principle of both his creation & knowledge, thereby revealing the greatness of man & his unalienable Right & Duty to throw off any Government where Despotism exists or is clearly in the process of forming.